The Moon continues to move towards to the left along the southwest horizon. Due to the shallow angle between the ecliptic and horizon, it remains stubbornly low in the sky. This evening the Moon is located in front of the constellation of Libra. This is a faint constellation and may even be invisible for observers in large cities. Luckily the Moon will be moving closer to a few brighter objects over the next few days. Now is a perfect time to take a closer look at the Moon. A small telescope or binoculars will do. 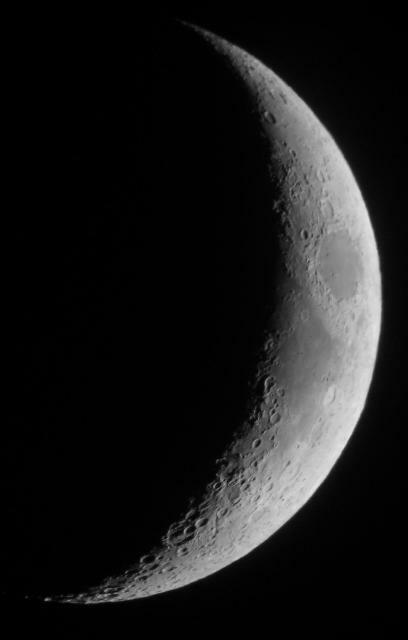 Only a quarter or less of the disk is illuminated by the Sun, still the whole of the Moon is faintly visible due to bright Earthshine. Just a little magnification will show 2 common geological formations. In the image below, note the many small circles. These are craters caused by the many asteroid and comet impacts that have occurred over the past 4 or so billion years. Unlike on Earth, there is no air or water processes to erase old craters. That is except when old craters are destroyed by newer craters. Also note, that craters are more obvious near the terminator, the boundary between sunlight and darkness. Currently, the terminator marks where sunrise is occurring. Another common feature are large round dark regions. Two are visible near the middle of the illuminated crescent. These are called mare and are old impact basins that were flooded later by gigantic lava flows. Well examine these in more detail at a later date since they are more obvious when the Moon is closer to Full. 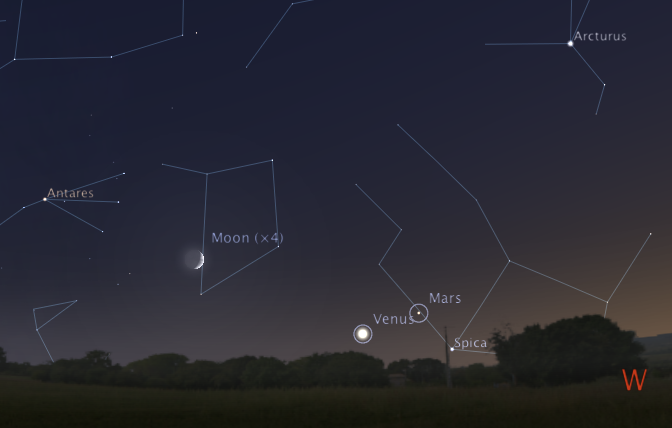 Tomorrow – Day 5 – The Moon visits Antares, one of the largest stars in the sky.